Here at TWICS we are a small team who work closely together so we are always really sorry when a member of our team leaves. Joe has been in charge of our finances for the past five years. However, the time has come for him to take his well earned retirement so on the 31st March we said goodbye to him. However, Joe being Joe, can’t stay away and he is still coming in to the office whenever he can to help us as we transition over to a new routine for maintaining our accounts! His formal leaving do was a quiet lunch in the office with the immediate team – this is what Joe wanted…he hates a fuss! 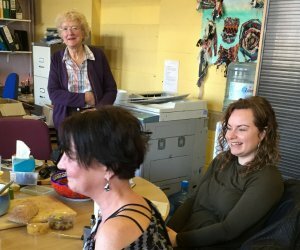 We all brought in some lovely food that Joe enjoys and had some drinks – non alcoholic of course! 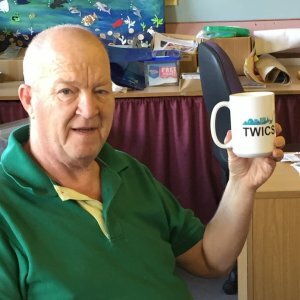 Joe was presented with a large mug with a thank you from the TWICS team on it. He enjoys his cups of tea and a small mug was never going to do! 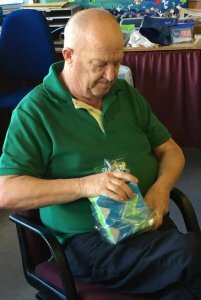 He also received some book tokens – he is doing some courses in his retirement and so this is something that he really wanted. Anyone who knows Joe will know he has a great talent for using puns. Many a time one or other of us has been caught out. We think he is being serious and then you look at him and there is a twinkle in his eye which tells you that he’s caught you out again! We will miss his wonderful sense of humour here in the office! We would like to wish Joe all the best in his retirement. He certainly deserves a well earned rest – although we’re not sure that he will take one. His course will keep him busy along with the host of volunteering that he already does – such as in the Museum. He is devoted to his wife and we hope that they will enjoy some quality time together – Joe certainly deserves a well earned rest! However, he is always welcome in the office whenever he is passing – we are keeping a large tea mug here for him!